Classic nursery rhyme book featuring 6 familiar rhymes. The 6 pages contain beautifully illustrated popular rhymes to read and sing along to. Sound effects, phrases and light-up animal buttons encourage baby to interact and explore. While individual sliders activate fun responses to the nursery rhymes stories. Develops early language skills and manual dexterity, while promoting early reading concepts. Hard plastic pages are durable and easy to clean. 3 Months + Batteries included…. This toy costs approximately £12.99 (for the latest and best prices make sure you check our retailer list for the VTech Animal Friends Nursery Rhyme Book above). In our review of VTech Animal Friends Nursery Rhyme Book we classed it as being suitable for ages 0 to 11 months but recommend you check the manufacturer specific advice before purchasing. 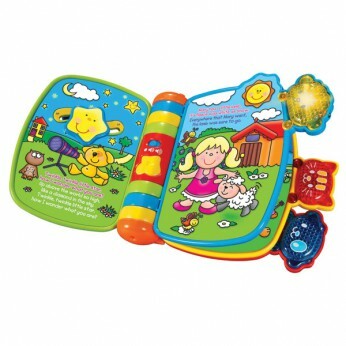 Great toy, had it a while a my little one still love it, discovering the lights and sounds on each page.